The Honda Civic Natural Gas has been crowned 2012 Green Car of the Year by Green Car Journal, during the LA Auto Show in the USA. 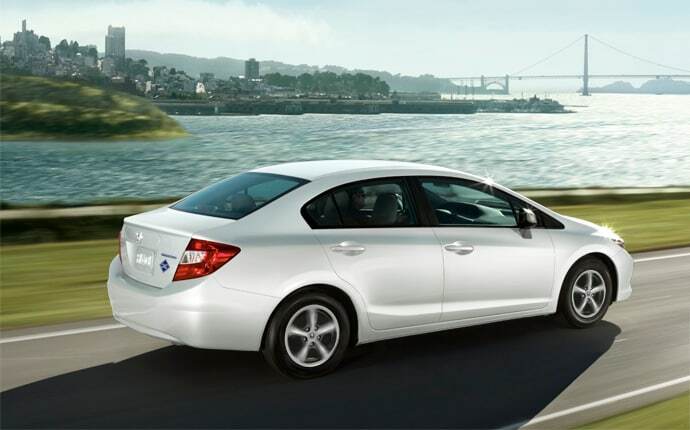 The 2012 model is the fifth generation of the Honda Civic Natural Gas. Currently, it’s the only production natural gas car manufactured in the United States. The Honda Civic Natural Gas uses a clean fuel as its power source, which is domestically sourced. Natural gas costs drivers 30 to 50 per cent less than petrol. The car has an average fuel efficiency of 38 miles per gallon. This can be increased by using the ECON button. It has a range of 240 miles on a full tank, which is almost three times the range of an average all-electric car. Prices for the Civic Natural Gas start at around US $26,000. Filling the tank takes around five minutes at a fuel station that has natural gas. Alternatively the car can be filled more slowly at home in the garage, if the owner has a wall-mounted refuelling kit from BRC Fuel Maker. Although natural gas still produces greenhouse gases in its combustion, it is more environmentally friendly than petrol or diesel. In case of a spill, it is safer, as it is lighter than air and disperses quickly. Natural gas can be blended with biogas or on its own. Competitors for the prize of 2012 Green Car of the Year were the Mitsubishi I, Toyota Prius V, Volkswagen Passat TDI and the Ford Focus Electric. The Honda Civic Natural Gas was chosen as the winner by a jury of six automotive and environmental experts, as well as editors from Green Car Journal. Honda has been at the forefront of developing fuel efficient cars since the late 1990s, when it launched its first hybrid car – the Honda Insight. Since then it has produced a number of hybrid production models in various generations – currently there is the Honda Jazz (also known as the Fit), the Civic Hybrid, the Insight, and the CR-Z. The company recently unveiled a supercharged hybrid concept car – the CR-Z Mugen.